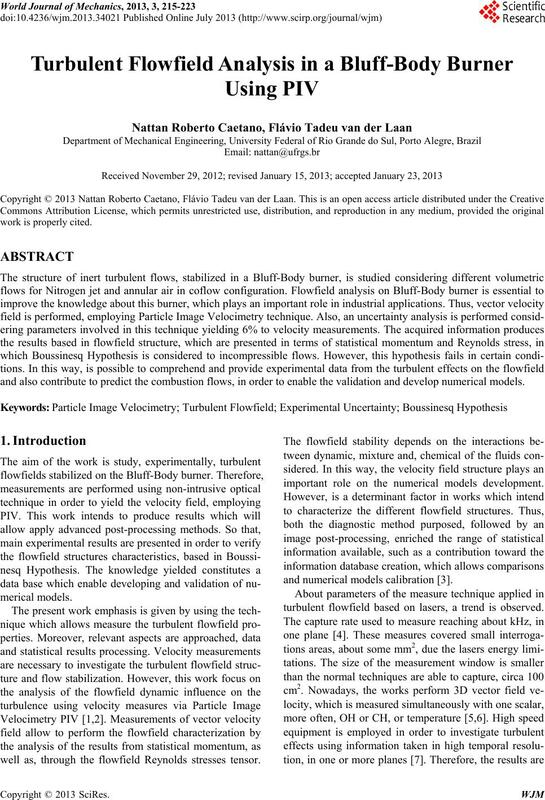 and also contribute to predict the combustion flows, in order to enable the validation and develop numerical models. 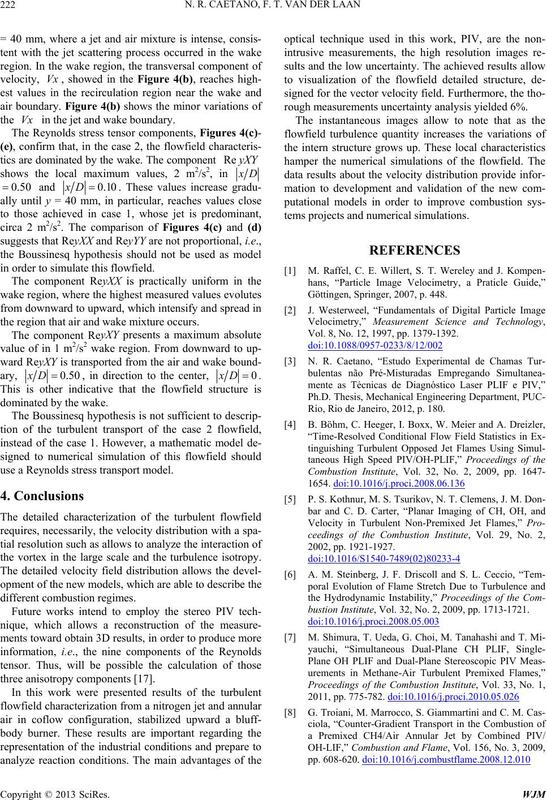 well as, through the flowfield Reynolds stresses tensor. important role on the numerical models development. and numerical models calibration . turbulent flowfield based on lasers, a trend is observed. strain and stress rates . turbulence, used in order to homogenize the flowfield. to the burner surface, which is centered in the fuel jet. ble (Nikon, Nikkop, f/1.4, 50 mm). noise relation is sufficient to produces quality images. this purpose by the literature [2,11,12]. sure the velocity measures within the expected range. should be smaller than the characteristic buoyancy time. 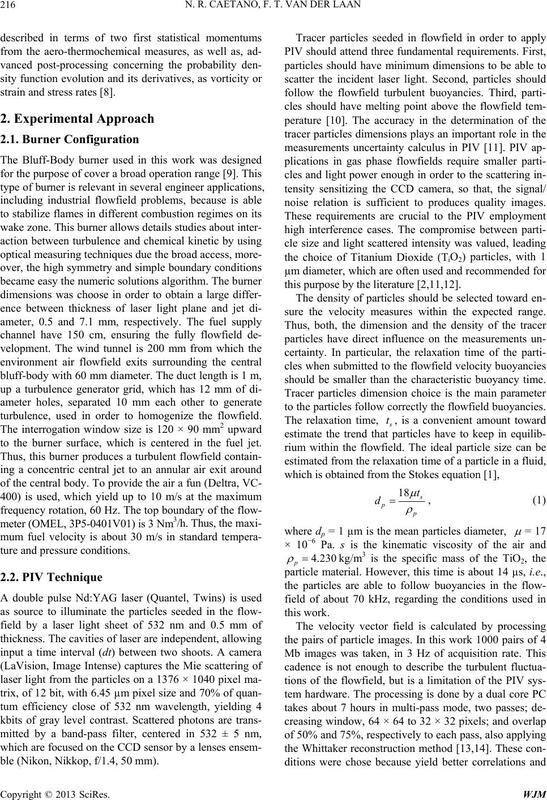 to the particles follow correctly the flowfield buoyancies. tion target, using an algorithm of search and recognizing. 90 µm, with 0.5% of uncertainty. ticles diameter with a low dispersion (σ = 0.3). the velocity of the annulus air in the burner flowfield. sions in the frames and of the respective displacements. work was measured using TSI Particle Sizer equipment.  to processing windows of 32 × 32 pixels. image objects in the frames and the subpixel adjustment. achieved by simulations reaches usp = 3% . field dynamic structure produced in a Bluff-body burner. between frames in PIV are presented for each case. velocity field, obtained on the burner symmetry plane. terval between each other upward of the burner surface. Table 1. 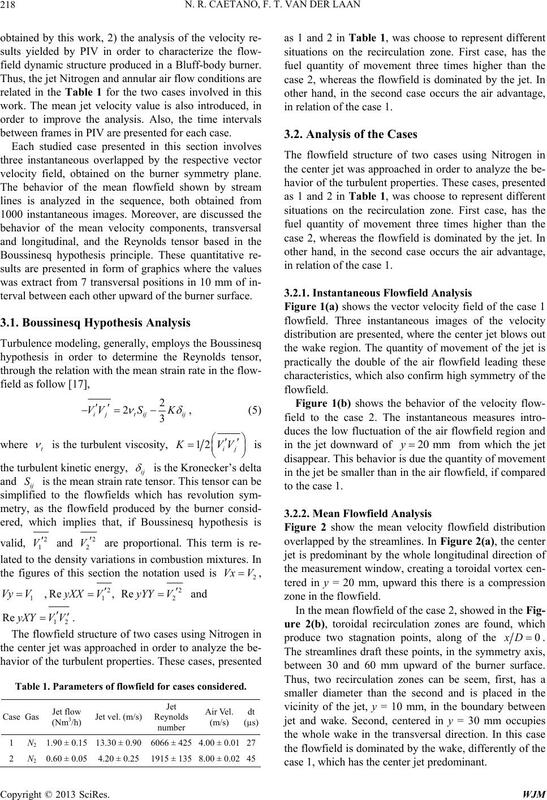 Parameters of flowfield for cases considered. in relation of the case 1.
between 30 and 60 mm upward of the burner surface. case 1, which has the center jet predominant. Figure 1. Case 1 (a); 2 (b): Instantaneous velocity. Figure 2. 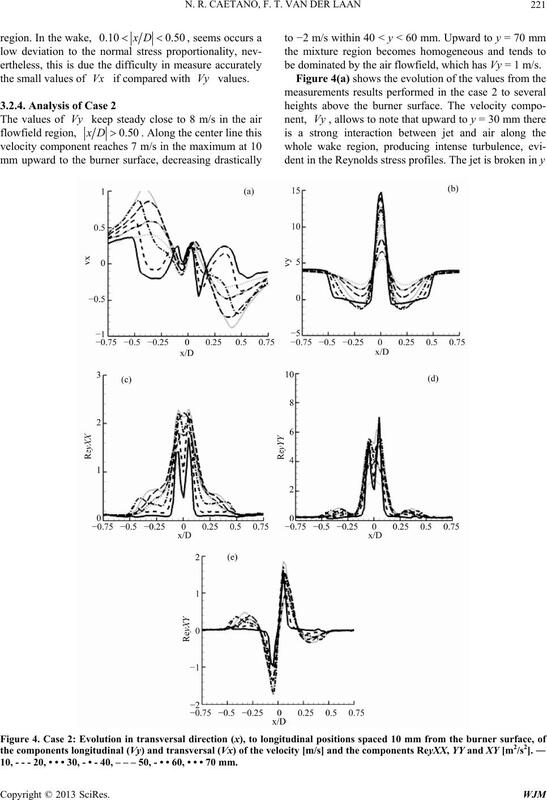 Case 1 (a); case 2 (b): Mean velocity vectors and streamlines. tween jet and air flowfields. 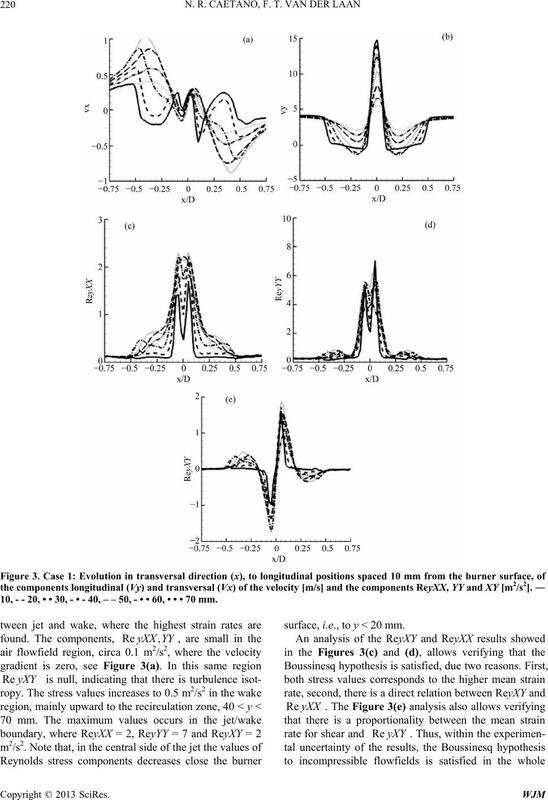 in Figure 3(e), is related with the flowfield shear rate. 10, - - 20, • • 30, - • - 40, – – 50, - • • 60, • • • 70 mm. surface, i.e., to y < 20 mm. the small values of if compared with values. be dominated by the air flowfield, which has Vy = 1 m/s. 10, - - - 20, • • • 30, - • - 40, – – – 50, - • • 60, • • • 70 mm. the in the jet and wake boundary. in order to simulate this flowfield. the region that air and wake mixture occurs. use a Reynolds stress transport model. 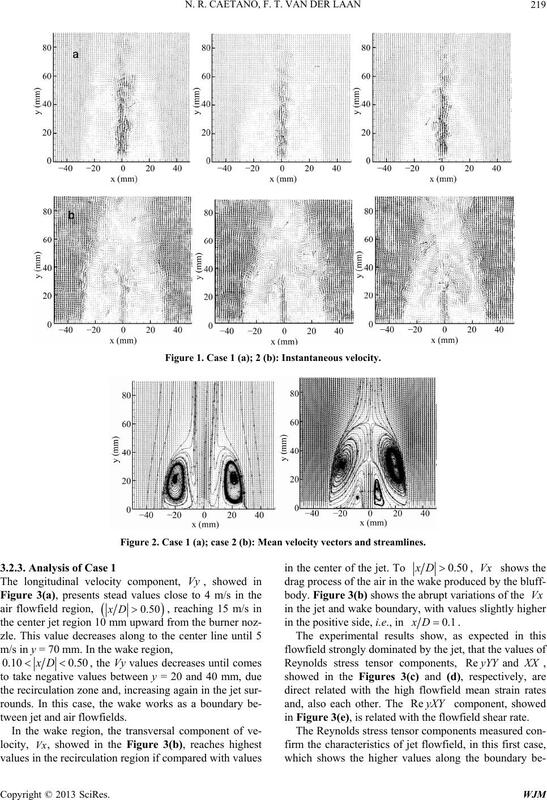 the vortex in the large scale and the turbulence isotropy. rough measurements uncertainty analysis yielded 6%. tems projects and numerical simulations. Göttingen, Springer, 2007, p. 448. Vol. 8, No. 12, 1997, pp. 1379-1392. Rio, Rio de Janeiro, 2012, p. 180.
bustion Institute, Vol. 32, No. 2, 2009, pp. 1713-1721. Rio, Rio de Janeiro, 2008, p. 169.
de Análise Aplicados à Combustão,” Papel Brasil, 2010. 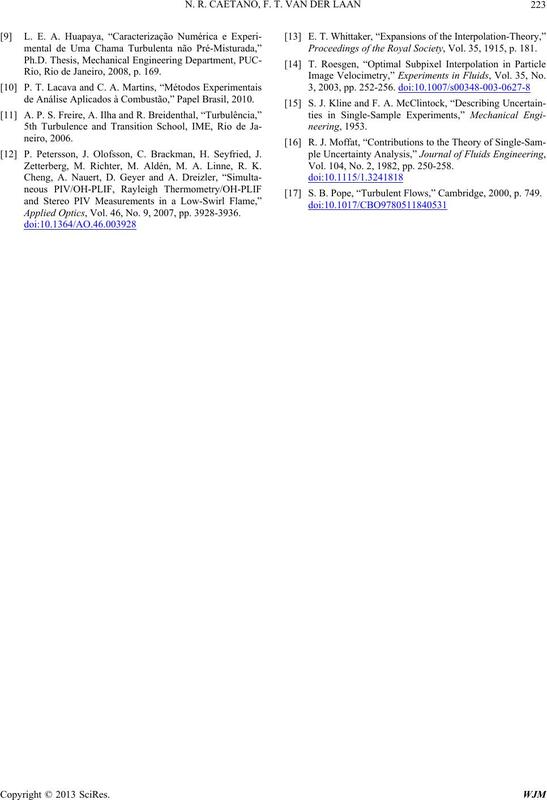 P. Petersson, J. Olofsson, C. Brackman, H. Seyfried, J.
Zetterberg, M. Richter, M. Aldén, M. A. Linne, R. K.
Applied Optics, Vol. 46, No. 9, 2007, pp. 3928-3936. Proceedings of the Royal Society, Vol. 35, 1915, p. 181. 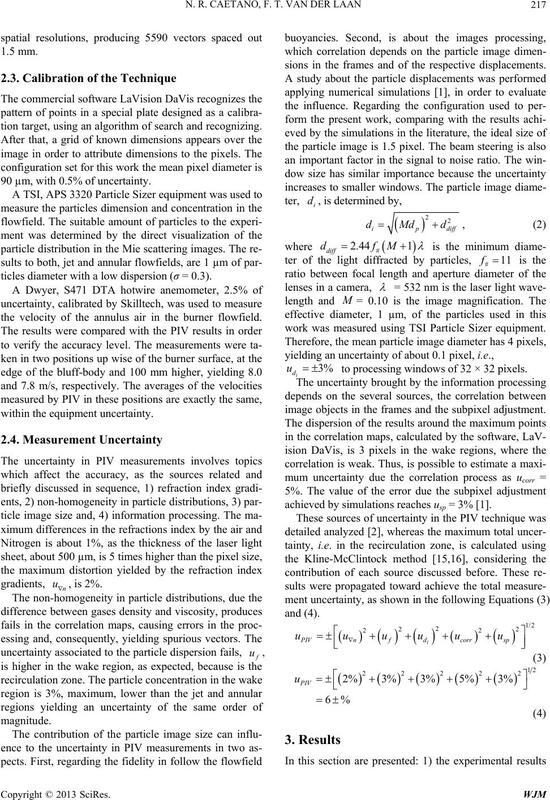 Image Velocimetry,” Experiments in Fluids, Vol. 35, No. Vol. 104, No. 2, 1982, pp. 250-258. S. B. Pope, “Turbulent Flows,” Cambridge, 2000, p. 749.